Effects of NAA BA and Sucrose On Shoot Induction and Rapid Micropropagation by Trimming Shoot Of Curcuma Longa L.
Shoot tip of Curcuma longa L. were used as explants. These explants were cultured on MS medium supplemented with various concentration of (0, 1, 2, 3 and 4 mg/l ) BA and (0,0.5, and 1 mg/l) NAA. They were significant difference (p≤0.05) in each parameter. Explants which cultured on MS medium supplemented with 1 mg/l NAA and 2 or 3 mg/l BA gave the highest average number of new shoots ( 2.4, 2.6 shoots, respectively) and number of leaf (5.4 leaves), optimum number of roots ( 2.6 roots per shoot) and plant height (4.5 cm). In MS medium supplemented with only 2 mg/l BA produced the highest average number of shoot (2.6 shoots) and 5.4 leaves per shoot. When trimmed explants in longitudinal section (LS) to 2 and 3 sections. At 2 sections gave the highest number of new shoots (4.3 shoots per section). Explants which cultured on MS medium with 60 gm/l gave the highest average shoots and leaves per bunch, longest and biggest size of root. The design of a beach cleaning trailer is presented. The basic design principle of a foreign beach cleaning machine was taken into consideration. Apart from the tire and hydraulic hoses, all components of the beach cleaning trailer were made from steel. This study focuses on stress analysis in the ball bearing housing by the finite element method. Actual tests have been carried out in fields. 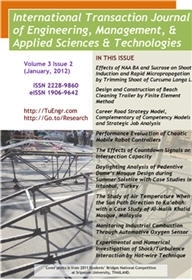 This study aims to report the performance of the beach cleaning trailer. Stresses in the ball bearing housing are calculated by FEM. Strategic Job Analysis (SJA) and Competency Models (CM) both have the potential to fill an important void in Career Road Planning (CRP). This paper deals with a strategic model of career road planning to magnify organization and employee's situations in career road guiding complying with the strategic goals of the organization. To approve this meaning, It is assumed that career road planning is a project in organization's human resource management plan. It is then concluded through the investigation of different aspects of job analyzing and competency models that these methods are not able to present a complete solution in directing of career in road of organization's strategic goals because these approaches omit employee's role as a stakeholder in analysis and selection of career road. This paper presents a model with regard to two aspects: amount of career planning independency from organization's goal and stakeholder (organization and employee) roles to guide the strategic career road planning. Based on this analysis, it is inferred that the degree of employee’s independence is an important parameter in the career planning project’s environment that can be used to explain different strategies in career road. We suggest four distinct types of career planning strategies: obedient servant, independent innovator, flexible moderator and strong leader making job analyzing more clearly than previous approaches. autonomous mobile robot is to increase and to take advantage of coverage areas resulting from its travelling paths. Large coverage areas are desirable for many applications such as robots designed for scanning of unknown workspaces with borders and barriers of unknown shape, as in patrol or cleaning purposes. The chaotic behavior of the mobile robot is achieved by adding nonlinear equations into the robot kinematic equations, like Arnold, Lornez, and the Chua’s circuit equations, that are well known equations for had a chaotic behavior. The performance of the three controllers is tested in four different scenarios and evaluated in the sense of the wide area coverage, the evenness index, and trajectory length. This study presents the effects of countdown signals on the total start-up lost time of automobiles at signalized intersections based on the data collected at intersections in Bangkok, Thailand. This countdown signal is used to warn motorists in queue at the stop line during any red phase on when the green phase will be started. The data indicated that the countdown signals did not have any effects on the saturation headway of automobiles, but on the total start-up lost time. With the use of the countdown signals, the total start-up lost time was decreased from 4.3 seconds to 2.9 seconds, or was reduced by thirty-three percent. Therefore, the countdown signals may be used to increase the capacity of signalized intersections. Keywords: Illuminance level; Pendentive dome; Istanbul; Orhan Gazi Mosque; Firuzaga Mosque. In this study, the analysis is to measure lighting performance of single pedentive dome type in mosque design built during the Ottoman Empire in Istanbul, Turkey. The selected case studies are the Firuzaga and Orhan Gazi Mosque. This study investigates whether Turkish style’s pedentive dome mosque design provides efficient indoor daylighting in the Orhan Gazi Mosque in compression with the Firuzaga Mosque. This assessment is simulated during summer solstice occurred when the sun is perimetering at its most northern position along the Tropic of Cancer. This study applies simulation analysis using Autodesk software known as 3DStudio Max Design 2011 programme. The weather data file was used to provide weather information and climate changes of the study area. The analysis shows that both mosques have mostly an evenly distributed illuminance level with Scale 3, 4 and 5. The Orhan Gazi Mosque has slightly higher illuminance levels compared to those of the Firuzaga Mosque. The study concludes that the pedentive dome mosque design has an effect on the mosque indoor daylighting. Having excellent illuminance level distributed at all the locations is one of the crucial reasons why the mosques with pedentive dome roof cover are built by Ottoman master builders. A field study on the environment condition especially air temperature was carried out in the main prayer hall of Al-Malik Khalid mosque, Penang, Malaysia. The main purpose of this study is to investigate and observe the indoor air temperature conditions during the occurrence of the sun path towards qibla direction on 16th July 2010. The scope of the study covers the main prayer hall under the pyramid roof. A quantitative method was used in the analysis by using thermo hygro anemometer instrument to measure the indoor and outdoor air temperature. The temperature was measured hourly, during daylight hours from 7am to 7pm in July 2010 from 15th to 17th. The result obtained shows that the mosque has the correct and accurate orientation to the qibla. In addition, there are no significant difference between the day of 16th July where the sun was perpendicular over the Ka’abah and one day after and before. The average difference between indoor and outdoor is about 0.46°C to 1.71°C. The monitoring of oxygen percentage in flue gases is one of various ways of controlling efficiency and emissions of industrial combustion. In general, flue gases analyzers are expensive and not accessible to small scale industries. The automotive Lambda sensor is an oxygen sensor which controls the electronic injection of the modern internal combustion vehicles. The aim of this study is to present two methods of measuring the oxygen concentration in flue gases of industrial combustion by the use of the automotive Lambda sensor. One method uses the voltage signals of a heated Lambda sensor and the other one uses the Current Reversal Mode (CRM) of operation of such sensor. Results presented in this article show that such methods are effective to control industrial combustion. In the present paper, an experimental investigation has been carried out to observe the amplification of turbulence intensity after shock/turbulence interaction by hot-wire technique. The hot wires are installed in the wake of turbulent grids to measure turbulence fluctuations before and after the reflected shock interaction with turbulence. It is observed that the turbulence fluctuations for less open area of the grid plate are higher than the turbulence fluctuations for more open area of the grid plate. For numerical computations, grid plate of 49.5 % open area is used. The average longitudinal velocity line obtained from experimental velocity data simulates with numerical results properly and in some places, 5-7 % deviations are observed with numerical results. All the simulation results indicate that the present code with turbulence model is working properly. The substantial amplification of pressure fluctuations obtained from experiment is observed after interaction. The dissipation rate of turbulent kinetic energy (TKE) and the levels of length scales are determined numerically. It is observed that the dissipation rate of TKE and the levels of length scales decrease after shock/turbulence interaction.